There may still be a touch of frost at night, but this must be one of the sunniest weeks ever for theatre in Carmarthen. “Tir Sir Gar” is evidence of a company aspiring to make work of national significance after decades spent in slumber. 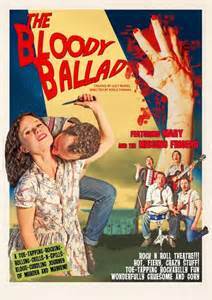 A new generation can also be felt behind “the Bloody Ballad”, making theatre that is filled with a joyous, hedonistic, self-confidence. The antithesis of the inward-looking, self-pitying, who-really-wants-this-stuff Heritage Theatre, it brings in an audience whose average age is twenty-two. They whoop and cheer. Theatre is collaboration, and a range of talents has contributed to this Ballad. Theatr Iolo are co-producers. Dafydd James is credited in that most modern of roles, the creative associate; a dash of Jamesian mischievous humour is discernible. Kevin McCurdy is impressive creator behind the head-buttings and full-on punches. Jem Treays is on movement, Dan Lawrence on sound. The programme gives thanks to NoFit State, the Sherman and National Theatre Wales and others who have lent a hand. But after all the help, director Adele Thomas’ production on the road is a van, a sound desk, Katy Stephenson on stage management, and five performers on a flat studio floor. “The Bloody Ballad” opens with a foursome, drummer Tom Cottle on vocals for Eddie Cochran’s “Something Else”. Accordionist-guitarist Hannah McPake takes the lead for a Johnny Cash number, and then Lucy Rivers’ boogying Mary makes her entry. She holds centre stage for over an hour. Mary never loses a quality of pearly-smiled guilelessness, that should send her to the stage of the Grand Ole Opry rather than to the venue of her final performance. (Folsom features more as a name-check to country music’s most celebrated place of incarceration than one of strict geographical consistency.) Oliver Wood is her dramatic opponent, in bovver-boy jeans and braces, with a moody pace and a glint in his eyes. For “the Bloody Ballad” his hair has been cut back to a three-inch strip from temple to the nape of his neck. Hannah McPake re-enters the action as an apparent helper, with the biggest eyes ever behind a pair of retro spectacles. She sings the ballad “Drift Away, Slip Away”, before revealing that she too is something else. Her new manifestation includes leopard-print dress, black stockings and a near-to-hand whisky flask. “The Bloody Ballad” has a storyline not far from the fare to be found in the small hours on satellite’s channel 318. But it is served up with such a strutting humour and sweetness to its black heart as to make it irresistible. Dan Messore’s tremendous guitar swings across all the moods. Jane Lalljee lights the back screen in Lisa Leighton’s design with the red flames of hell. Carmarthen is the show’s eighth venue, and “The Bloody Ballad” is set to travel out and on. An early scene of dialogue and character exposition entails some fussy passing of a microphone to and fro. A revisit to the scene would be beneficial, to let the actors move more, to let the natural voices work, to up the pace. “The Bloody Ballad” moves to the Torch and London, then a send-off gig at Chapter 17-19 July, before a month-long run at a central venue in Edinburgh. It is a cultural export that should be a cause of pride to all.